Jaci Pulice hails from from Oceanside, NY. She began improvising in 2003 when she joined "Mission Improv-Able" during her freshman year at American University. Jaci has taken the complete curriculum at Upright Citizen’s Brigade Training Center and studied musical improv at Washington Improv Theater. She performed with the WIT Harold team Gone Baby Gone and can currently be found performing with the ensembles iMusical and Commonwealth. In addition to performing with WIT, Jaci created and directed both The October Issue, as part 2015 Women’s Voices in Theatre Festival, and Summer 2017’s Yearbook. Jaci Pulice is a Lead Recruiter for Beacon Hill Staffing Group, one of the nation's leading staffing consulting firms. Jaci is enthusiastic to bring her relationship management, sales, and recruiting expertise to WIT’s board. At Beacon Hill, she is responsible for creating a pipeline of potential talent through direct sourcing, on-campus recruiting and professional networking. She builds and maintain relationships with prospects, candidates, and placements as well as on campus career center staff and hiring managers. Jaci has been performing, teaching and directing with WIT since 2012 and she’s excited to contribute to the community in a new capacity. I can wiggle my ears, prepare to be amazed! Jaci made it her goal to start teaching improv when she was a student at Upright Citizen's Brigade Training Center. 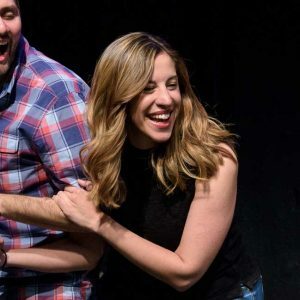 When she started musical improv class at WIT in 2012, she knew she had found a great improv training program in D.C. that she wanted to be a part of. Teaching is a highlight of Jaci’s week. She loves seeing students develop their love for this art form, whether it be for performance, practice, or play. She pushes students to take the things that “live inside them” and bring them to the stage. She finds it extremely rewarding to help people grow their confidence and craft. Jaci has been teaching at WIT since 2013. She is a current member of the WIT ensembles iMusical and Commonwealth. In addition to performing with WIT, Jaci created and directed both The October Issue, as part 2015 Women’s Voices in Theatre Festival, and Summer 2017’s Yearbook. She previously was a member of WIT Harold team Gone Baby Gone. Her first improv team consisted of her and her sisters in Oceanside, NY. Every now and then they have a reunion show with complimentary antipasto.